Effective since August 2012, European Market Infrastructure Regulation (EMIR) was brought in to boost transparency and reduce counterparty risk in the EU’s over-the-counter (OTC) derivatives market. Initial obligations – typically reporting requirements – came into force in 2013 with the final phase due on 1 December 2015. EMIR regulatory reporting will impact any EU entity that enters into a derivatives contract – as well as any non-EU counterparty that trades with said entity. 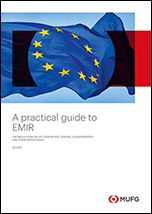 For a practical guide to EMIR, please click here.